Mitt Romney's campaign estimates it will raise at least $800 million in its quest to defeat President Barack Obama this fall, according to a fundraising memo circulated among top supporters. The memo, obtained by the New York Times' Nicholas Confessore, says the campaign hopes to raise $500 million in high-dollar donations for the campaign and for the joint fundraising account it has set up with the Republican National Committee. Romney aides hope to bring in another $300 million from small donors—an area where the former Massachusetts governor has lagged during the GOP primary. In addition to the $800 million raised directly by the campaign, the memo estimates super PACs supporting Romney's candidacy will raise at least another $200 million to support his general election bid—bringing the GOP's overall fundraising target to at least $1 billion to defeat Obama. A Romney aide declined to comment on the report. That's on par with what Obama's campaign has estimated it plans to spend in the 2012 election. Last year, Obama aides estimated the president would raise at least $750 million for his re-election bid—though that total is now likely to be far more given that Obama has signed off on several Democratic super PACs to raise and spend millions to help him win a second term. Obama enters the general election with a major fundraising advantage. Through February, Obama had raised nearly $160 million for his re-election campaign—not including another $126 million he's raised for a joint fundraising account between his campaign and the Democratic National Committee. On Monday, the Obama campaign announced it had raised another $53 million for the campaign and the DNC. 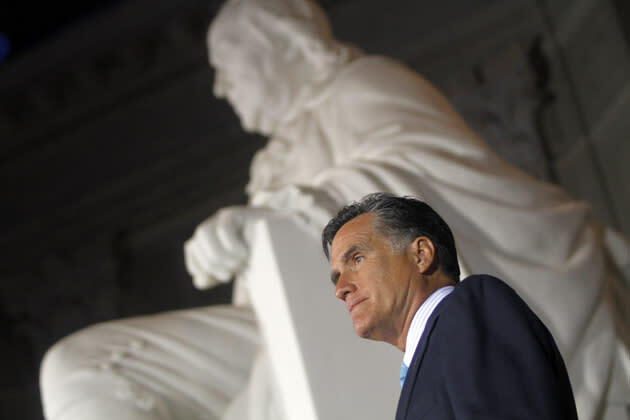 The Romney campaign has not yet disclosed its March fundraising totals.